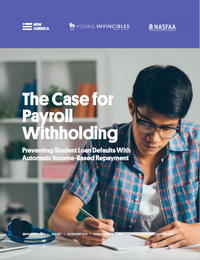 A new paper, The Case for Payroll Withholding, co-authored by New America, Young Invincibles, and the National Association of Student Financial Aid Administrators argues that automatically enrolling indebted students in Income-Based Repayment (IBR), and automating repayment through employer payroll withholding, could help to simplify the student loan system for students and radically reduce the number entering default. Motivated by increasing default rates — one in five student loans will enter into default at some point during repayment — lawmakers on both sides of Congress attempted to help borrowers by introducing, and then reforming, Income-Based Repayment. The program ties borrowers’ repayments to their income, rather than loan balance. It therefore acts as a type of risk-mitigating insurance: when borrowers earn less, they pay less; when they are unemployed, they pay nothing. However, struggling borrowers are still defaulting, and in response many policymakers have argued for some or all borrowers to be automatically enrolled into Income-Based Repayment. The report compares four distinct, and progressively more ‘automated’ policy alternatives: (1) the status quo; (2) a system of automatic enrollment; (3) a system with automatic enrollment in which the federal government retrieves income information from IRS or Social Security Administration records but still requires borrowers to pay manually, and (4) a system of automatic enrollment in which borrowers’ employers calculate the amount they owe and then automatically withhold that amount from the employee’s paycheck. We that only automatic IBR coupled with employer withholding would adequately simplify the student loan repayment system through automation and simultaneously mitigate risk by tying repayment to present income. The report also argues that automatically enrolling borrowers into IBR is extremely difficult to implement, and any haphazard approach could make the repayment system worse.